Any day will feel like a holiday if you have Chocolate Volcano Cake. An easy cake recipe, it is the best chocolate recipe I have ever made or enjoyed eating. A decadently rich chocolate cake filled with a thick chocolate sauce, they are called volcano cakes or lava cakes because when you cut into the cake, the hot chocolate middle comes out like molten lava. 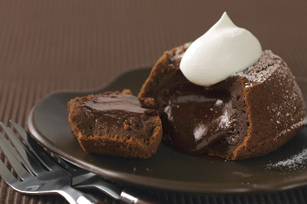 Serve this scrumptious treat warm with a light coating of confectioner’s sugar. To make this special dessert even better, serve with a scoop of ice cream. These delicious gems are a popular item on most restaurant menus but you can easily make them at home. 1. Preheat oven to 375 degrees F. Generously butter 6 large non-stick muffin tins or ramekins. Sprinkle a little granulated sugar on bottoms and sides of each tin or ramekin, tapping out any excess sugar. 2. Prepare the cake mix according to the package directions. Set aside. 3. Mix together chocolate, caramels and condensed milk in a microwave-proof bowl. Microwave for 30 second intervals, stirring each time, until chocolate and caramels are melted and sauce is smooth. 4. Spoon the cake batter into muffin tins or buttered ramekins, 2/3 of the way full. Add 2 tablespoons of the chocolate caramel filling and then top off the rest of the tin or ramekin with more cake batter. 5. Bake at 375 degrees for 12 -15 minutes. Watch closely as you do not want to over bake. The cakes are done when the outside is a normal cake consistency but the middle is gooey. 6. Remove from oven, wait 5 minutes, then carefully unmold onto plate. Sprinkle with confectioner’s sugar or top with whipped cream and enjoy.